Serves 12. Choose 6. 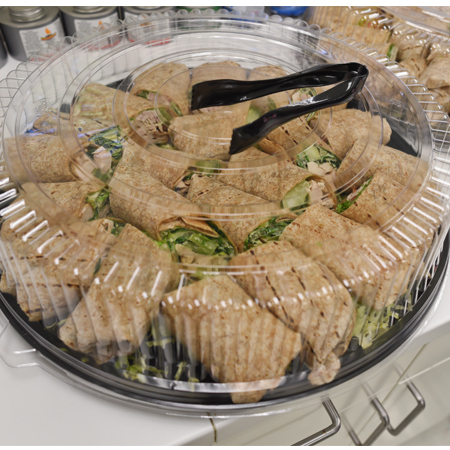 (wraps are cut in half) Choose from Veggie Hummus, Turkey Club, Reuben Wrap, Buffalo Chicken, or Chicken Caesar. Please call 1-860-673-3463 to place order. Please allow 24 hr notice. cooked to order. 24 pieces. Mini Burgers with pickles, cheese and dijon sauce. The fresh ingredients of our House salad with a few exciting additions. We add fresh diced avocado, red onions, Kalamata olives, and top it with your choice of crispy or char grilled chicken and your choice of one dressing. 24 pieces. Mini blackened or grilled chicken burgers topped with American cheese, carmelized onions and chipolte aioli. 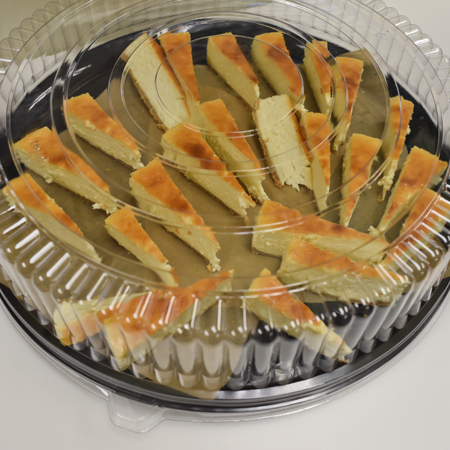 Choose individual platters or choose a platter package. Please allow 24 hr notice. Serves 25. Served warm w/ corn tortilla chips. Serves 25. A mountain of tortilla chips and our homemade salsa. Serves 25. Served with an assortment of crackers. Serves 25. A medley of crisp garden veggies served with bleu cheese dipping sauce. 25 pieces. Marinated chicken skewers served with a spicy Thai dipping sauce. 25 pieces. Marinated steak skewers served with a teriyaki dipping sauce. 48 hr notice 50 pieces. Large sea scallops wrapped in smoky bacon served with dijon dipping sauce. 40 pieces. Five assorted house pizzas with a variety of toppings. Mac & Cheese, Spinach & Artichoke, White Cheese, OMG...Bacon Cheeseburger. 50 pieces. Choose original buffalo, honey mustard, habanero, BBQ, or Thai. One flavor per order please. 24 pieces Double stuffed with grilled chicken, caramelized onions, smokey bacon, fresh cilantro, Monterey Jack and Cheddar cheeses. Served with sour cream. 24 pieces. Mini turkey burgers with American cheese, whole cranberries and an herb aioli. Dozen. Your choice of turkey or corned beef served on our famous dinner rolls topped with American cheese, fresh sliced tomato, and leaf lettuce. Mayo and mustard served on the side. cooked to order. 24 pieces. Mini bison burgers with a touch of chipotle peppers with American cheese, avocado aioli, and onion strings. 25 pieces. Finger food-sized, served with Uncle Fred's Secret Sauce. A house favorite! Crisp romaine with toasted croutons prepared with our famous creamy ceasar dressing. Penne pasta cooked Al Dente and tossed in our signature garlic cream sauce and topped with plenty of grated Reggiano. Penne pasta and local peas tossed in a smooth, creamy sauce amde with tomatoes, cream and a splash of vodka, topped with grated reggiano cheese. Tender herb marinated chicken breast sauteed with fresh mushrooms and finished with a rich pan made marsala suace. Our fresh chicken breast is lightly floured and pan seared just crisp and then tossed with our garlic cream sauce, chopped spinach and fresh tomatoes. 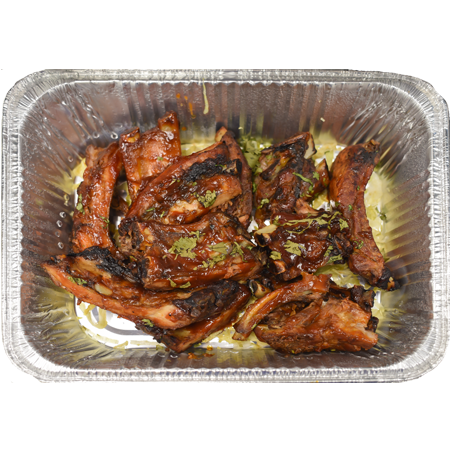 Marinated for 36 hours and slow grilled until tender and basted with our house prepared bbq sauce. If there was a bone the meat would fall right off of it! Thin slices of sesaoned chicken breast pan seared with fresh lemon and reduced with white wine and finished with capers. Serves 3-4. Our brown rice medley is prepared with house made chicken stock and finished with a crispy vegetable mix of shredded carrots, red bell pepper & scallions. Serves 3-4. Italian style risotto cooked slow and painful way, but oh so worth it! Cooked to a perfect al dente and topped with plenty of Reggiano Parmesan cheese. Serves 3-4. Red bliss potatoes blended with garlic, cream, and cheese. 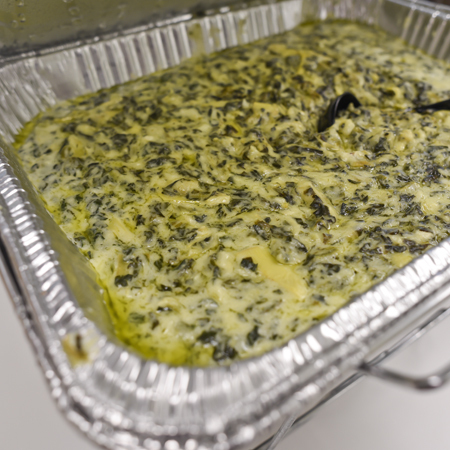 Topped with frizzled onions for a rich and very tasty dish. 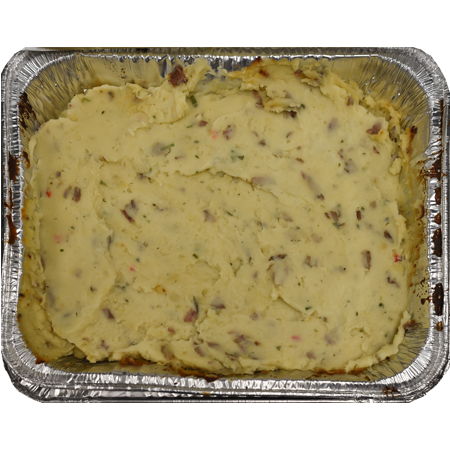 Serves 3-4 Our home style potato salad is prepared with red bliss potatoes, celery, onions, and our secret seasoning. Serves 3-4. Prepared with shredded carrots & crispy green onions tossed in our house prepared creamy dressing. Call 1-860-673-3463 to place order. All Dessert items require 24 notice. 24 hr notice item. 25 pieces. Large ripe strawberries dipped in chocolate ganache. 24 hr notice item. 24 pieces. Our take on a New York Classic. Its rich, creamy, thick and moist. 24 pieces, Baked fresh daily.